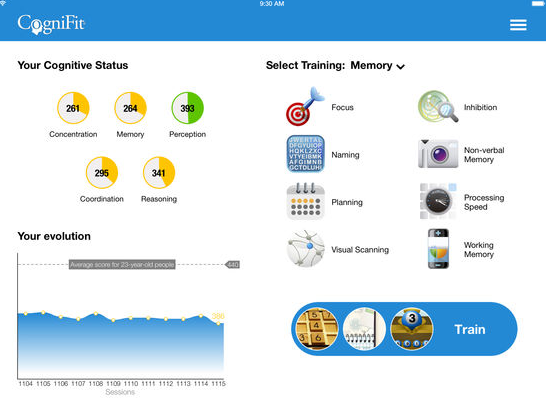 CogniFit is a mobile- and web-based cognitive training app. It uses short, simple-to-learn games aimed at training different cognitive functions, such as perception, memory, hand–eye coordination, etc. Users can choose between a personalized training session that consists of 3 games selected by the program, or games based on the user’s preference. A training session takes about 15 minutes to complete, and it is recommended that users complete at least 3 training sessions per week. Performance feedback and cumulative scores are presented, enabling users to monitor their progress. It is important to note that while the app offers a variety of programs targeting different conditions, our review focused mainly on daily cognitive brain training for conditions the content seemed most fit to support based on evidence-based studies (for example, we did not include the course for ADHD in our examination). Easy to learn, adaptive games/ User can choose which area to focus on/ Easy-to-produce reports to share with professionals/ Free 3-day trial with full access/ Initial assessment is offered. No integrative feedback on users’ progress/ Lack of motivating features/ Monthly fee may be considered high. CogniFit is an interactive and engaging program with an appealing game design. It is mostly suitable for people who can find the time and internal motivation to practice during the week, for the adult to elderly population, and for people who have experienced some sort of cognitive decline (due to injury or illness). The program provides more features on the web platform than on the mobile app. For optimal use, the combination of both devices is recommended. CogniFit developers describe a personalized program based on a short (10-minute) initial assessment and the user’s ongoing performance. In our evaluation, the program’s personalized training most of the time was compatible with areas that needed improvement, but not with areas that needed the most improvement. It could be, that in long term use the program targets the user better toward areas in need of improvement, but at initial use that wasn’t observed. Games are short, easy-to-understand, and attractively designed, which makes training an engaging experience. However, although the recommended goal is 3+ days a week of training, it seems that CogniFit lacks the ability to properly motivate users. The ongoing feedback is based mainly on graphs and progress bars, and there is no integrative verbal feedback in the user’s general recommended goal, strengths, and weaknesses. As all cognitive training programs, CogniFit is based on the notion that cognitive training in areas of difficulty can slow down cognitive deterioration or improve performance. Although some research has shown a link between the practice of specific cognitive tasks and the improvement or slow of decline in deteriorated functions (like memory, driving, etc. ), the current cumulative knowledge in the field of cognitive training does not match the extent of knowledge in other treatment orientations that target other clinical aims (e.g., CBT for depression). In addition, the ability of cognitive training to partly rehabilitate or slow down cognitive impairments related to specific illnesses – such as schizophrenia and Alzheimer’s – is still being evaluated. Therefore, users should be aware of these limitations when utilizing the program. CogniFit could be used as a supplement to treatment for patients looking for cognitive training. The program offers a medical platform for health professionals that includes a number of features: cognitive function screening, patient monitoring tools, and batteries of clinical exercises. On the user’s end, CogniFit includes an option to send progress reports to a physician or to print them out (which is useful if the physician is not a CogniFit member). The therapist can assist in providing ongoing support to encourage the continuous use of the program.